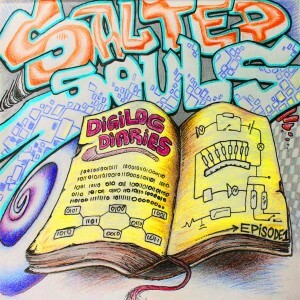 HorsePower Productions is proud to present Digilog Diaries, the debut release from Salted Souls, the side project of German producer GastraxX. As Salted Souls he shows a playful and smooth mix of downbeat and deep trance with strong positive vibes. This release will take you on a colourful and comfortable journey, giving you a big grin from beginning to end. Sit back, smile, and enjoy! Mastering by Anti-Logic, Berlin, with artwork by Salted Souls/GastraxX. MP3 Download | FLAC Download | WAV Download · Download count: 7,029. I like this very much.. it’s something special. As always, high quality stuff on Ektoplazm. I’m liking the tunes. Thanks! A high quality release that pushes boundaries and paves new ground, while staying firmly rooted in it’s obvious influences. They hit the nail on the head with “deep trance with strong positive vibes”. Ektoplazm remains THE source for high quality free psychedelic music, and I’m always so glad to find an incredible release from across the world every time I come here. My favorite track on this release is “Meanwhile”. A downtempo trance tune with a driving dub bass line, and wide open ambient spaces that have both feet firmly rooted in psytrance and the aforementioned dub reggae.